In a job search and in your own business, if you don’t understand the new ways of finding and creating job opportunities, you are losing out because you are invisible! Newly updated for 2019 on 11/20/2018 with a done-for-you client package I used in my 4 to 5-figure national transition assistance program and with private clients! Do you inwardly cringe when a client or prospect asks that deceptively simple question, “What should I do now?” after finalizing their resume? Do you feel like this whole online job search and social networking for job search thing is way beyond you and it seems impossible to ever get caught up? Do you want to tap into new revenue streams that make your per-client profits grow while ensuring your clients are fully prepared to succeed at today’s changing job search? Do you wish you had the time and skill to build your own online identity to increase your visibility? 70-80% of recruiters and employers state they source talent for job openings through social media sites. What’s a job seeker to do? How’s their coach and resume writer to guide them?? The change taking place in how jobs are found is simply startling. Job seekers need to find their place online and they need you to lead them there. 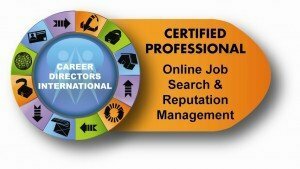 CDI’s Certified Professional in Online Job Search & Reputation Management (CP-OJSRM) will steer you through this maze and provide you with the tools, practical knowledge, and examples to expand your skill set, grow your business, and empower your clients to succeed in this new arena! NEW: The new 2019 version includes 50 pages of bonus done-for-you materials you can use with clients! While you are learning what to do for your clients to establish, clean up, or grow their online presence and perform their job search, you can apply the same tools and techniques to yourself and your business! Our first graduate of the course took this to heart and used herself as one of the final case study campaign projects. Using the tools in Module 7, she first determined her current online visibility so she could then begin ramping up her online presence so that her name and her business are more accessible online. What a silver lining – grow your skills, grow your business simultaneously…you could even expand your client base to other consultants and entrepreneurs who face the same challenges! The best of tried-and-true job search strategies and how to perform them efficiently and effectively online. Cutting-edge social strategies which encompass online networking and job development as well as online identity and reputation management. Tools you can use to help your clients AND boost your own online visibility and expertise. A new revenue stream for your business coupled with added success for your clients! You’ll make more money per client while increasing your confidence and their results. An easy way to reduce risk of clients blaming the resume for their lack of success when they don’t know how to job search. A ready-made 50-page bonus packet of done-for-you resources to guide your client through self-assessment, search preparation, and job search. Utilize the web to more easily find the information you are seeking. Determine a client’s existing online identity. Capitalize on online tools to find hidden jobs. Create LinkedIn profiles for clients (includes sample profiles). Leverage free online resources to identify hidden jobs, careers, new industries, and networking opportunities. Assist clients in finding contacts and getting endorsements. Help clients join LinkedIn groups, ListServers, and discuss groups to establish expertise and get noticed. Teach clients how to use LinkedIn to search for contacts at companies. Write articles and updates on LinkedIn to build identity and authority. Guide clients to establish a presence on Twitter and then create an information campaign of expertise. Help clients to use Twitter to monitor industry activity and opportunities with various job search and monitoring tools. Show clients how to become active on Facebook, especially those in consulting or self-employment. Help clients to establish a blog presence or become a content curator to showcase their expertise and become known in their space. Teach clients to make networking contacts through discussion groups and ListServs while establishing their expertise. Advise and assist clients to clean up (and avoid) digital dirt on the Web. Position clients to go viral with their expertise (or at least information share). Teach clients about the do’s and don’ts of online video, and understand why it’s in demand today. Use free tools to create a an online portfolio presence outside of standard social networks. Resell (affiliate relationship) online job search tools and hidden job search training materials for win-win profits and client success. Gain media attention from journalists to get quoted on the Web and in print. Publish articles on the Internet as well as press releases and e-books. Provide advice to clients on starting radio shows and creating podcasts. Leverage online career management tools for smooth tracking and transition. Leverage mobile job search applications, mobile job boards, and mobile social networking. Develop strategy campaigns using all the above tools, which focus on online identity campaigns for job seekers, consultants, and solo-preneurs; career research campaigns (resources for pursuing a new career), and job opportunity identification campaigns. Increase your per-client revenues and your client successes. In short, you will have the knowledge, confidence, tools, and skill to direct your clients on how to navigate the online job world successfully while also boosting your own social media visibility. The course begins with your introduction and big bonus done-for-you client package followed by recommended (not required reading) and moves into seven modules of course material with exercises for completion in each which will be submitted as part of a final portfolio of work. The ninth module includes the sample campaigns and instructions on creating three such campaign case studies for the completion of the portfolio. These case studies can be created on real or fictional clients, and have even been completed by students on their own personal and business identities. Your mentor will be available via email to answer your questions and provide feedback on your module exercises. Upon successful completion and approval of the portfolio and case studies, the certification will be issued. There is no final exam. Any career professional, working with clients at any and all levels, who wants to understand how to effectively utilize the Internet for job search, online identity, career management, industry/professional/job research, and reputation management. Remember – this course blends old and new so while you may come upon techniques with which you are familiar, we have made every effort to introduce new techniques and online spins that make the common easier, more efficient, more innovative, and more effective. Since it is a self-paced curriculum, you can take as long as you need within one calendar year of registration. However, most students would be able to easily complete the program in approximately 6-8 weeks by committing 3-5 hours per week. There are no live class sessions to ensure you have the flexibility to work at your own pace, day or night. You will be provided with support and feedback from the course creator as your mentor throughout the program to ensure your success! Please be advised that you must maintain an active CDI membership to complete any phase of the program. Any updates created in one year of purchase will be automatically accessible. *If you are not currently a CDI member, please select the Non-Member rate above as it includes mandatory membership. For non-members who desire a 3-pay option, membership should also be added to the cart and then the member 3-payment option can be selected. To become a CDI member or to learn more about membership visit the Join page. The CP-OJSRM certification must be renewed every 2-3 years (depends on release of updates as this is a volatile industry) by purchasing the program update modules. Depending on how comprehensive industry changes are, the update may range from $25-300. (Higher cost will involve total program revamps, which have now happened four times since the course launched in 2005). All requirements of CP-OJSRM certification, renewal, and CDI membership standards must be maintained in order to earn or retain a CDI credential. CDI reserves the right to revoke a CP-OJSRM credential for any of the following: Renewal requirements are not maintained and completed within required timelines. Membership lapses due to non-renewal. Individual is found guilty in a court of law for a grievance within the industry (unprofessional, unethical, unlawful conduct and/or business practices). 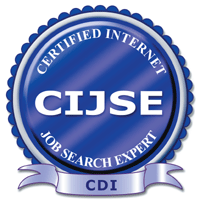 CDI still recognizes the original CIJSE logo, although the course is no longer offered and the information is considered out-of-date as of February 2011. It is recommended that you update as soon as possible to the CP-OJSRM, which incorporates the new and critical online job search trends of today. CDI membership is a prerequisite for registration. For more information on membership visit the Join page. For more information on the CP-OJSRM credential, contact CDI at info@nullcareerdirectors.com. I am so excited about all of the amazing tools I learned about through the OJSRM certification modules! I am still having fun picking new ones to explore further each day. The best thing about the Internet Job Search Expert certification course is that I have been able to apply the material immediately and on a daily basis with my students/clients. The course takes you through every aspect of the internet search process and truly coaches the coach on how to teach clients to network and market themselves strategically. This is a must have course for anyone who coaches or works with job seekers. The job market is changing every day. The traditional ways of finding work has changed forever. This course teaches how to find and secure job opportunities on-line. The information and materials are in abundance! – Catherine Palmiere, Adam Personnel, Inc. The CIJSE taught me different methods of gathering information from the Internet (far more than just the Internet job search as noted in the title). I learned to search more efficiently, effectively, and, most useful to me, the course made me think “outside the box”. First of all the CIJSE was well worth the money! What I like best from the course are the tools that were provided to conduct company research. Once you set up your alerts, you are done! This way our clients do not have to search for hours online or pay a fee to find research on their target companies. The course teaches you not to go in circles on the internet and keep researching the same sites all the time. Our clients can do this forever! This is great information to share with our clients to help move them forward. I remember telling Laura of CDI the CIJSE should be a ‘requirement’ for us as part of the CARW. The information is very good! I really believe that in order to best serve our clients (especially now in this economy) the knowledge gained from this course will not only help you, but help your clients. Just the targeted industry resources alone is worth the time, effort, and money. You may wonder why you need a certification to do a job search on the internet and who would need a certification for that. Well, you don’t, but this course kicks up the concept a notch and teaches you how to be more efficient so it doesn’t have to be as time consuming for you or your clients. For those of you leery of taking a test, I am, too. The CIJSE test includes the research you will conduct. This course is not a mind-bending course if you are afraid of the testing. It is a course that give you a myriad of tools and resources necessary to conduct an effective job search for your clients and add an additional source of revenue for you. Or, you can teach them how to do it. I prefer the latter because I am a trainer too…and like the concept of give a man a fish and he will eat for a day, or teach a man to fish and he’ll eat forever. =) This course has really helped me even when teaching my clients about the Federal job search so it can be applied to both private sector and Federal in a sense.